sizes for baby, toddler, and adult. Knit in the round on circular needles. 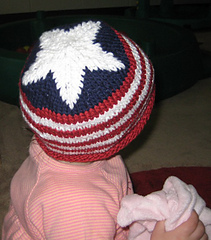 Uses 2 color stranding and symmetrical decreases at the top. Original pattern knit in TLC Cotton Plus Worsted Weight, but can be knit with any worsted weight yarn (wt = 4) in the appropriate colors.